What is Hopi Ear Candling? Ear candling is a holistic therapy that helps to improve symptoms of problems associated with the ear, nose, and throat. The treatment involves placing a hollow cone-shaped candle made of cotton that has been soaked in beeswax, honey, and herbs into the ear canal to remove excess wax and treat other problems. Ear candling can bring about a sense of deep relaxation and it can leave your clients feeling de-stressed and energised. It is believed that the Ancient Greeks were the first to perform ear candling as part of cleansing and healing rituals. Then the Egyptians, Mayan, and Inca people adopted the practice. The ear candling technique we know today was first used by a Native American tribe called the Hopis, and this is where the name comes from. The Hopis used ear candling in healing rituals, and the ingredients they used in their candles, cotton, beeswax, honey, sage, and chamomile, are still used today. Before you carry out a treatment, you should discuss your client’s medical history and ask about any symptoms they are currently experiencing to determine whether ear candling is appropriate for them. You should then place your client in a comfortable position on their side with their head supported by a pillow. Their hair should usually be covered with a small towel. The candle is then gently inserted into the ear and it’s allowed to burn for around 10 minutes. When the candle is lit, the warm air rises and creates a vacuum, which stimulates the ear to get rid of wax and other blockages gently. Removing the wax and blockages clears the inner ear and the sinuses which should relieve any feelings of pressure. Explain to your client that they may hear a crackling sound and feel a warm sensation as the candle burns. The candle should then be removed gently from the ear and extinguished in water. The treatment is then repeated on the other ear, and the session finishes with a massage around the ears, face, and neck to promote lymphatic drainage and to boost the effects of the candling. Allow your client to lie still for around 15 minutes after the treatment and give them a drink of water. When should the candles not be used? Hopi ear candling is a natural holistic treatment, though there are some risks. Care should always be taken when handling the lit candle and inserting it into a client’s ear. If you would love to be able to offer this relaxing and soothing treatment to your clients, why not train with us? All our courses are taught in small groups which makes for a relaxing learning environment where you’ll get all the attention you need. Steph, our academy director and trainer, has over 20 years’ experience in the industry so when you book a course with us, you’ll be perfectly prepared to be the most successful therapist that you can be. For more information on any of our courses, call Steph on 07825337342. So you want to do some beauty therapy training. You know what type of course you want to do, and depending on the course, you might have saved up for it for a long time. But how do you know which training provider you can trust to give you high quality training, value for money, and a great experience? All beauty courses are not equal. Standards and prices can vary, and some courses won’t prepare you very well for working in the industry at all. We want to take the headache out of deciding where to do your training, by giving you some tips on how to choose a beauty therapy training provider. What experience does the training provider have? How long have they been providing training and what relevant industry experience do they have? How much is the training going to cost? Training is a big financial investment usually, and while more expensive training is not necessarily better quality, neither is going cheap. It’s difficult, but before you part with any cash, try thinking about the benefits that the course is going to give you in the medium to long term. Ask if the course cost involves materials and equipment or not, and factor in how much travelling to and from the course is going to cost too. What facilities does the training provider give you access to? Is there adequate space for delivery of the training, and is there ample car parking? Is all equipment you’ll be using safe and in good working order? Are training dates flexible and do you know exactly what will be required of you? For some courses, you might need to do written coursework for example. Check that your chosen course is accredited. This means that by passing it, you have been assessed to be of a certain standard. Employers will always ask for industry standard courses. Do you get support after your course? Will your tutor be accessible after the course so you can ask questions and get some guidance? Do they have good feedback from learners? This is a really good test of how good a training provider is. Have people left good reviews about the training they received or are the reviews not so good? Why choose Essential Beauty Academy for your training? Our director, Steph, has over 20 years’ experience in the industry, and she’s worked everywhere from salons, to cruise ships, in schools, and now she’s the lead tutor in her own business. Steph moved into teaching because she wanted to share her knowledge, skills, and experience with others, and to teach them how to do the job she loves. She strives to provide learners with a friendly and supportive learning environment, because she understands that students can lose their confidence if they feel like they can’t quite get the hang of something. Doing your training with someone who really cares makes all the difference. Steph teaches almost every course and classes are kept small, which makes for a relaxed learning environment. When you leave the academy, you’ll not only leave with the skills to do treatments, you’ll leave with the confidence to be a very successful therapist. Choose Essential Beauty Academy for a great learning experience. There’s nothing better in life than being able to do what you love, and make other people feel amazing in the process! 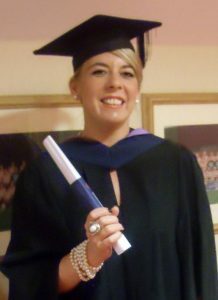 And this is exactly what made Steph, our academy director, choose a career in beauty therapy. We spoke to her about why she started her own business and why she’s so happy to be doing what she loves, every single day. What made you choose beauty therapy? “I was only about 9 years old when I realised that I wanted to do beauty therapy. I got some nail varnishes for Christmas, and I remember feeling so excited. I was full of joy as I opened the lid and started painting my nails, even though they looked a total mess! What do you love most about working in beauty therapy? “I loved working as a therapist, but I mainly teach others now, so there’s more of an emphasis on me passing my knowledge and skills on to others. I love watching my students grow and seeing their confidence build, and they can do that when they train at the academy because it’s such a relaxed environment. I can’t narrow down what I love about beauty therapy to just one thing, but making people feel good about themselves and watching them leave the salon feeling amazing has to be pretty high up the list. What do you love most about being self-employed? What have your biggest career challenges been? “There have been so many challenges over the years. 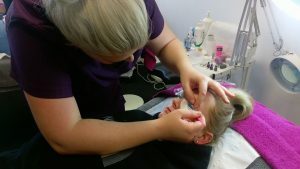 When I first started my beauty therapy training, I really lacked confidence, and I realised this has a lot to do with the person who trains you. This is what inspires me to be supportive and understanding with my students. I worked on cruise ships and I aspired to be a manager, but unfortunately, I was put off this idea because I didn’t have a good manager who inspired me, and my time at sea ended. What advice would you give to anyone wanting to work in beauty therapy? “I would say go for it, be committed to it, work hard, and always keep your skills up to date. This is how you get to be the best you can be. Go for a job that will give you the most experience in the industry, for example, working in a spa will be a very different experience compared to working in a salon. When you apply for a job, always keep in your mind what you would like to specialise in. If you’re thinking about a career in Beauty Therapy, why not train with us, and put yourself on the path to doing your dream job? All our courses are taught in small groups which makes for a relaxing learning environment where you’ll get all of the attention you need. Steph, our academy director and trainer, has over 20 years’ experience in the industry so when you book a course with us, you’ll be perfectly prepared to be the most successful therapist that you can be. Making someone look and feel their best is so rewarding, and this is one of the main reasons why people choose a career in beauty therapy. After you have completed your qualifications, you might want your own salon, but what if this is not a practical option straight away? Well, one option is that you can set up your own mobile beauty therapy business. It gives you the chance to do your dream job, and fit it around your other commitments. Many clients use a mobile therapist to do their treatments when it’s convenient for them. Clients can have the same choice of treatments in the privacy of their own home as they can have in a salon. 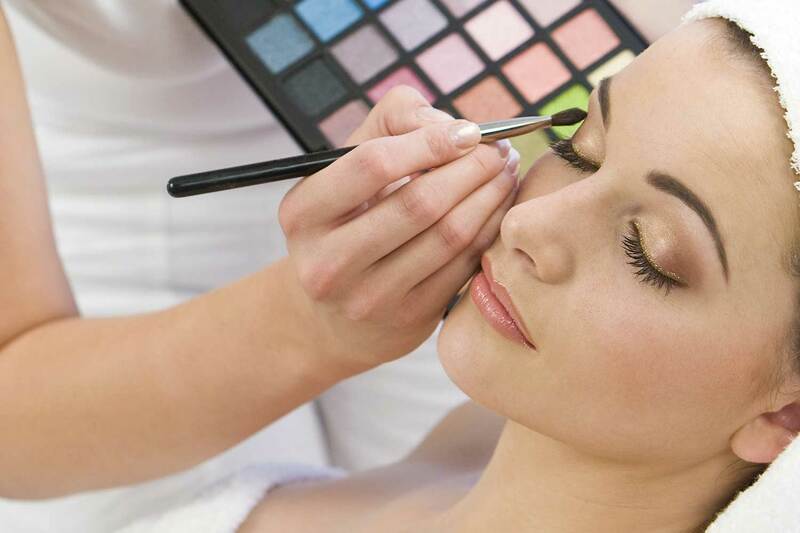 Here’s how to start a mobile beauty therapy business. Here at the academy, we offer a mobile beauty therapist qualification, which is a comprehensive 8-day course, focusing on the most popular and most often requested treatments, to get you on the path to running your own successful mobile beauty therapy business. Once you have completed your training, you can add on further courses if you wish. The more you can offer clients, the more they will book with you, time and time again. What are the benefits of being a mobile beauty therapist? These are just some of the benefits of working for yourself. You might need some kind of trolley to transport any kit like a mobile couch, and a reliable car is essential. You will need to make sure you update your car insurance to include business usage. Any other equipment you need will depend on the services you offer. Makeup and associated products: If you’re going to be doing makeup, you’ll need a full makeup kit, and a chair for your client. Waxing kit: You’ll need things like paper towels, wax products, a heater to melt the wax, wax strips, and any aftercare products. 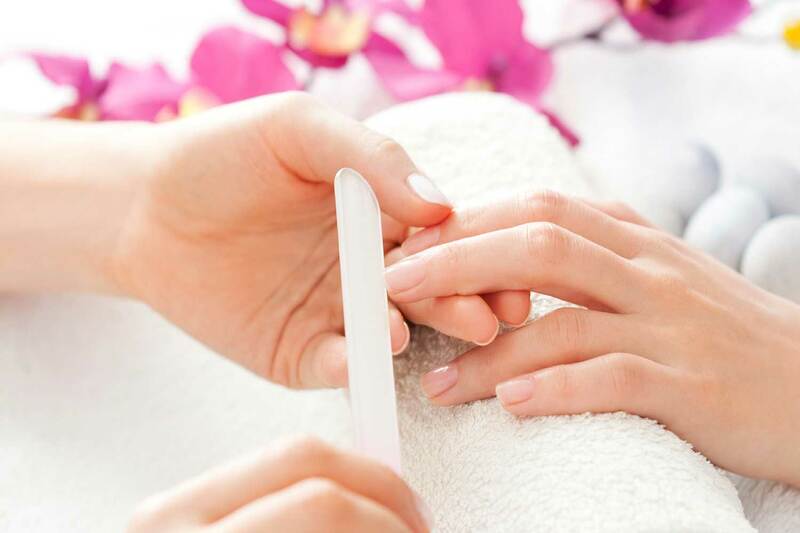 Manicure and pedicure equipment: You’ll need a variety of different nail colours, possibly a gel or nail extension kit if you’re going to be offering them, nail files, buffers, cuticle remover tools, and other hand and nail treatment products like cuticle oils. Massage kit: You will probably need to invest in a folding treatment table, towels, massage oils, and maybe some scented candles or similar. Insurance is a must when you are starting up, because you need to protect yourself and your clients. Look around for the most comprehensive insurance you can afford, even of it costs you a bit more, but make sure you’re getting a good deal. Not being fully insured could cost you more in the long run if you end up exposing yourself or your client to unnecessary risk. Remember too, that if you qualify in any new treatments, they will need to be covered by insurance too. Public liability insurance: Which insures you against claims made against your business by a member of the public. This can include injury and loss or damage to property. Product liability insurance: This applies to you if you sell products to customers. It insures you against any injury the product might cause to a client. Professional indemnity insurance: This insurance will cover the cost of compensation for customers who suffer loss or damage in the event of being provided with negligent advice or services by you. Your business name is a part of your brand, and it will give your potential customers an idea of what you’re all about. It’s fine to be creative, but remember that your business name and any logos will be associated with the business for a long time. Check that the name is not too similar to other businesses, especially those operating in the same area you’re going to be working in. This is one of the most effective ways of advertising. Tell your friends and family that you have set up a business, what you are offering, and ask them to hand out some business cards or flyers for you. Think about offering some discounts to entice people to use your services. Ask your clients to leave reviews, make sure they get an excellent service, and they’ll be sure to tell people all about you. A social media presence is a must for any business. Facebook is a great place to advertise your business as you can reach a lot of potential customers for quite a small amount of money. You can run competitions to win free treatments, or discounted treatments, you can post photos of your work, reviews from happy customers, and anything else you feel might be relevant to your current and potential customers. And as most of your services will be aimed at ladies, think about this; 76% of women have a Facebook account. Most people will look on the internet for recommendations when they are looking for beauticians. You can either create your own site for free, or you can invest in a professional web designer that will put a little professional polish on a site for you. Leaflets are an effective way of letting people in your local area know about your services, especially your prices and how they can contact you. They contain all the vital contact details clients need, plus they can double up as appointment cards, if you leave some space on the back. Don’t expect your business to take off straight away. Building a client base takes time. Focus on promoting your business through social media and word of mouth, and ask clients to leave reviews. Your reputation will soon grow. You can do a job you love and build a business to be proud of. The key is to offer a wide range of services at reasonable prices. One way to continually offer clients more, is to advance your skills by gaining more qualifications. A lash lift is a treatment that defines your lashes and lifts them from the root, making them point towards your eyebrows. This makes your lashes look fuller and longer, and it doesn’t damage your natural lashes. Silicon moulds are adhered carefully and gently to your eyelid, and then a gel is applied to the eyelash roots that lifts them upwards towards the eyebrows. It usually takes around 45 minutes to an hour to do a lash lift, and longer if you decide to add any treatment like a lash tint to further enhances the look of your lashes. How long does a lash lift last? The treatment lasts for 6-8 weeks, and this can vary. Some things can cause the lashes to drop more quickly, such as swimming, or using harsh products or heat on your lashes. You can wear makeup, but leave your lashes bare for at least 24 hours after the treatment. You will probably find that you won’t need mascara anyway. If you do want to wear mascara, wear a non-waterproof one, as waterproof formulas are harder to remove and can weaken the lash lift. Why should you sign up for our lash lift training? The treatment gives clients such fab results, they will become addicted to having it done, and because it lasts for 6-8 weeks, that means repeat bookings; great news for you and your business! They say the eyes are the window to the soul, and who doesn’t yearn for beautiful, long eyelashes? The secret to beautiful eyelashes is to care for the lashes you’ve got, and if you want more of a flutter, you can always fake it! The first step to getting beautiful lashes is to look after what God gave you. This can prevent them from breaking and help them become stronger and healthier. Apply a tiny bit of natural oil like sweet almond oil to your lashes every evening before bed. Take care not to get any in your eye! This will condition them nicely. There are some mascaras that contain vitamins and other ingredients that claim to condition your lashes and help them grow. Why not give them a go? high street mascaras are getting better all the time. Don’t rub your eyelashes too much or pull on them as they can break. Eyelash curlers can cause them to break if you use them too often, especially the heated ones. What if you want to fake it? If you aren’t blessed with naturally long fluttery eyelashes, there are a few options for you. You can fake it with falsies, which to be honest, have come a long way. 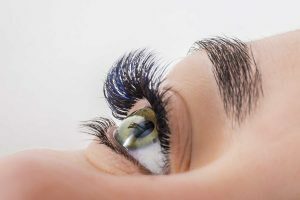 The downsides though, are that sometimes applying them can be fiddly, and some eyelash glues on the market can cause irritation of the eyelids. Or you can try eyelash extensions. How are eyelash extensions applied? Lashes are applied on at a time, using a semi-permanent glue. There are 3 types of lashes; synthetic, silk, and mink. How long does it take to apply them? Applying a full set of lash extensions usually takes around 2 hours. You can also get a half set of lashes, which can be used to make your natural lashes look fuller. Can the glue get into your eyes? This is unlikely as your eyes will be shut during the application. However, some glues can cause irritation in some people. If you experience a burning sensation, or any discomfort during the application, this is a definite sign that you might be allergic to the glue. How often should you get lash extensions done? Your natural lash growth cycle is around 6-8 weeks, and this is roughly how long a set of lash extensions will last. You might need a bit of maintenance every 4 weeks to maintain the fullness of your lashes. Do lash extensions fall out? Each extension is fixed to one of your own eyelashes, so they will naturally fall out as your natural lashes grow. Avoid picking at them or pulling them if you want to keep your extensions looking good for longer. Is there anything I should avoid after having eyelash extensions? Keep water away from your extensions for up to 24 hours after you have had them done, as water can weaken the glue. It is recommended that you avoid using any oil-based products on your lashes for the same reason, and don’t use waterproof mascara as it increases the likelihood that you’ll pull your extensions out when you try to remove it. If you want to wear mascara, apply it to the tips of the extensions only, as applying it at the base of the lashes can look clumpy. Will lash extensions damage my natural lashes? As long as your lash extensions are applied properly by a trained therapist, they shouldn’t cause damage to your lashes. But you have to make sure that you avoid rubbing your eyes or pulling on the lashes, as this is what can cause damage. If you would like to learn how to give your clients eyelashes that flutter and make them look extra glamorous, sign up for our eyelash extension training course, which covers everything from the initial client consultation, to lash application, aftercare, and removal. If you just can’t do without your regular wax but you dread the pain, here are some tips and tricks to show you how to prepare your skin for waxing so that it’s as easy and (relatively) painless as possible. You need at least ¼ inch of hair growth for an effective wax, if you have any less, you won’t get a good result and it will be more painful generally. Before you go for your wax, exfoliate to scrub away any dead skin and free any hairs that might be trapped under the skin. The less dead skin there is, the less pull there’ll be when the wax strips are removed and it will feel less painful. The best way to prevent ingrown hairs is to exfoliate regularly and keep your skin as hydrated as you can by moisturising when you get out of the shower. 30 minutes to an hour before your appointment time, try an over the counter pain reliever like ibuprofen to slightly take the edge off the discomfort. Generally, avoid getting a wax just before your period, as you tend to be more sensitive to pain. These cause skin sensitivity. Wait until you’re off the medication to get a wax. Any medications for acne or topical steroid creams are likely to make your skin thinner and drier than usual. This can cause skin lift which can leave a mark or burn on the skin and leave it vulnerable to infection. Applying aloe vera gel or something similar to the skin after the wax to calm any redness or irritation. Your skin will be sensitive and it needs time to calm down. It will also be a lot more prone to burning and the heat will cause irritation. Getting a spray tan is also a no no, getting a spray tan on waxed skin will result in stinging and a patchy tan! After a wax, your hair follicles are open, so your skin is more vulnerable to irritation from sweat and even infection. Wait 24 hours, then you’re good to go. Your hair grows in cycles, so having a wax roughly every 4 weeks is ideal. Don’t wear tight-fitting clothes after your wax, especially if you have had a bikini wax, as it can cause friction and discomfort. Waxing is a very popular treatment to offer clients, and waxing products are getting better all the time. Why not do one of our waxing courses and help your clients feel ultra groomed all year round? Massage is a technique that involves pressing, rubbing, and manipulating the skin, muscles, tendons, and ligaments. There are many different types of massage, and it is often considered as a type of complementary or alternative medicine. It is commonly being used alongside other treatments for different health conditions as its benefits become more well-known. Are there any risks involved with massage? People who have cancer, or pregnant women, should discuss massage therapy with their doctor. Before your massage, your therapist will ask about any health conditions you may have. They will then leave the room so you can get undressed. You will only need to undress to the point where you feel comfortable, and you will be asked to lie on the massage table and cover yourself with a towel or sheet that is provided. A massage session can last up to 90 minutes, depending on the type of massage you have. Don’t be afraid to tell your therapist if you prefer less or more pressure. Sometimes, if you have a knot that needs working out, it can feel uncomfortable, but if anything feels too uncomfortable, don’t hesitate to say so. Swedish massage is one of the most well-known types of massage and it forms the basis of other types of massage that you’re probably familiar with, including deep tissue massage and aromatherapy massage. If you are new to massage, or you don’t get one that often, a Swedish massage is a good place to start. When you have a Swedish massage, the therapist will use oil and perform different types of massage strokes to warm up the muscle tissues, release any tension and work out any knots. The therapist will usually start working on your arms, move to the front of your legs, then the back of your legs, and finish with your back. Swedish massage should generally be very relaxing, but remember to tell your therapist if you would prefer lighter or stronger pressure. Hot stone massage is a special massage, where the therapist places smooth, heated stones on the body. The heat is very relaxing and it also helps to warm up the tissues so the therapist can give you a deeper massage. The stones will have been heated before you arrive. You will usually lie on the massage table face down, then the therapist will start working on your back. The therapist will warm up the tissues with a Swedish massage, then they will massage you while holding a heated stone. As the original stone cools down, it is replaced with another. Larger stones are used on bigger muscle groups, while smaller stones are used on smaller muscle groups. The therapist might also place some heated stones on certain points along your spine, in the palms of your hand, on your stomach, or even between your toes, which is believed to improve the flow of energy in your body. Always tell the therapist if the stones feel too warm or the pressure is too much. A hot stone massage is not appropriate for you if you are pregnant, you have diabetes, high blood pressure, heart disease, or if you are on blood thinning medication. An Indian head massage is a relaxing treatment that uses acupressure massage on the head, face, neck, and shoulders. This type of massage has been practised in India since ancient times, and it’s geared towards encouraging balance and healing throughout your entire body. As well as this, the massage can relieve aches, pains, and tension in your neck, back and shoulders, relieve stress and help you sleep better. The massage can be quite firm but you’ll feel so relaxed afterwards. The day you get an Indian head massage is not the day to have your best hair do. You will most likely have oils massaged into your scalp so your hair might look like an oil slick! Just plan to do nothing but relax afterwards. Why not train with us? Who doesn’t love a massage? Why not join one of our massage courses and make your clients feel like they’re walking on air? A relaxed client is a happy client! Nothing makes a difference to your face like well-shaped eyebrows. They frame your face and can give it an instant lift. Brow fashion does change, and we’ve gone from the thin pencilled look of the 1990’s to today’s fuller brow with a prominent arch. But whatever is in fashion, you should think about which brow shape is best for your face and go from there. Step away from the tweezers! If you over pluck your eyebrows it can look unflattering and it will be all the more difficult to get them into a lovely natural shape. Leave them alone for a few weeks at least, no matter how tempted you may be to pluck them, and go and see a beauty therapist for a professional shaping. You can then just remove the stray hairs in between salon visits. Don’t stray too far from your original eyebrow shape, so no shaving bits off or making them look too different with makeup, because your natural brow shape is the one that will complement your face shape the most. Where should your eyebrows start? Draw an imaginary straight line from the outside of your nose to your brows. This is where the eyebrows should start on most people. If you have a large forehead, avoid removing too much hair from in between the brows as this can make the forehead look bigger. Place a ruler, or anything straight on the tip of your nose, and place it on a diagonal so it crosses the pupil of the eye. The point where it lies on your brow should be where the arch of your brow is. Once you have determined your ideal shape, use an eyebrow brush or comb and brush the hairs upwards. Carefully trim any excessively long hairs. It’s a good idea to use a white eyeliner or concealer to highlight any stray hairs that fall outside of your ideal shape so that you don’t over pluck. Use an eyebrow gel to tame unruly hairs, and use a pencil or powder to fill in any gaps. Always use a light touch. If you have very light eyebrows, choose a colour just slightly darker than your natural shade, or try eyebrow tinting. And nobody should be using a black pencil to fill in their eyebrows, even ladies with very dark hair. Use a dark brown pencil or powder, as black eyebrows are likely to look too harsh. Find a beauty therapist to help you determine the shape of your eyebrows. 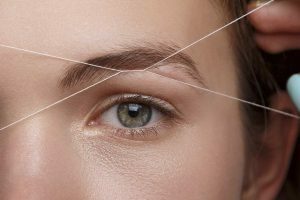 They will use techniques like waxing and threading to help you achieve your best brows ever. They will be able to help get your brows fairly symmetrical too, which is quite difficult to do on your own. Having nicely shaped eyebrows can make such a difference to someone’s face, why not learn how to be a brow expert by doing our brow shaping and tinting course? Here at the academy, we teach students how to do treatments that will help a client to look and feel amazing. But feeling amazing comes from not just looking good on the outside, but feeling good from the inside out. That is one of the reasons why we teach holistic therapies, such as reflexology, which is not only relaxing, it’s great for your general wellbeing. Reflexology is a form of complementary therapy which involves using massage and applying pressure to reflex areas in either the hands or feet. There are points on the hands and feet which are connected to certain organs and parts of the body, through energy channels. By applying pressure to these areas, any energy blockages can be removed which can then bring about health benefits. The right foot is related to the right side of the body and the left foot corresponds to the left side. The whole body can be treated through the feet. Why might someone get reflexology? Surveys carried out by The British Reflexology Association found that people who had conditions like stress, insomnia and IBS benefitted from having treatment. A review published in 2015 in the Integrative Cancer Therapies journal found that reflexology was effective for relieving cancer pain, especially post-operative pain. What is a reflexology session like? A typical treatment is 30 to 60 minutes long. The therapist will ask you to fill in a form about your health and lifestyle, and this information is used to personalise your treatment. You will then be asked to remove your shoes and socks and get yourself comfortable on the massage table. The therapist will assess your feet and apply pressure to certain points to find any areas which might be tender. Massage might be used to warm the feet, then finger and thumb pressure is then used to carry out the reflexology techniques. The sensitivity of people’s feet varies from person to person and the therapist will understand how to apply the correct pressure. The massage should not feel uncomfortable even if you have sensitive feet, and don’t worry about being ticklish; the therapist uses firm pressure. How will I feel afterwards? Most people will feel calm and relaxed after a reflexology session. You might notice that you feel sleepier than usual. Reflexology is generally safe but as with any treatment, it’s not suitable for everyone. Make sure you give the therapist an accurate picture of your health, and if you aren’t sure about whether the treatment is suitable for you, it might be a good idea to ask your doctor before trying it. If you have foot ulcers, a recent injury, any foot or ankle wounds, gout, diabetes, osteoarthritis in your foot or ankle, or a heart problem, reflexology might not be appropriate for you. Reflexology is usually safe in pregnancy, after the first trimester. If in doubt, see your GP for advice. Fancy giving it a go and really making a difference to the wellbeing of your clients? Do your reflexology training with us! Check out our full range of holistic courses here. Oncology Massage Has Arrived at the Academy! Level 2 Beauty Therapy Training is Here!